I had a conversation today with some friends about first dates. Actually, someone we know was going on one. It got me thinking that if I were to go on one now, I wouldn’t know what to do. Not that I plan on going on a first date any time soon. But if I were, I think I would be that awkward person that says in her head, “Don’t say that” and then actually does. My last first date was 26 years ago. Ugh, that makes me sound like I’m 79. And just like I would be now, I was pretty awkward back then. My date took me to this luxurious Italian restaurant in Boston’s North End called Dolce Vita. Up until then the fanciest place a date took me was Uno’s. But at Dolce Vita there wasn’t a deep dish pizza in sight and that was OK. I remember looking through the menu and thinking about all the least accident-prone dishes and not to order them. Like broccoli or spinach, because that could be a dental disaster. Long strands of pasta were also out because with my luck an accidental slurp would happen. That left the tortellini, which were tiny and delicate and manageable to eat. Conversation-wise I think I talked too much. “Like” and “um” were probably used about 50 times in a sentence. And I definitely went off-topic multiple times. I was so nervous and I’m the type of person that hates awkward silences. So to avoid them I talk on an on and don’t let the person I’m with get a word in edgewise. How I was ever asked on a second date I don’t know. But I’m glad he asked me. We’ve been on countless dates since and are still dating. I think I’ve graduated from my dating awkwardness now, though. Right? So speaking of going off topic. I was supposed to start this post about this delicious tofu. I know, tofu. Really? But that’s the way I felt about cauliflower fried rice and look at me now (http://www.thetastypage.com/cauliflower-fried-rice/) . Being Asian tofu was never thought of as anything weird. I don’t think I’ve met a tofu dish I didn’t like. Scratch that. Make that an Asian tofu dish I didn’t like. I don’t know how I feel about tofu hot dogs or tofu turkey. 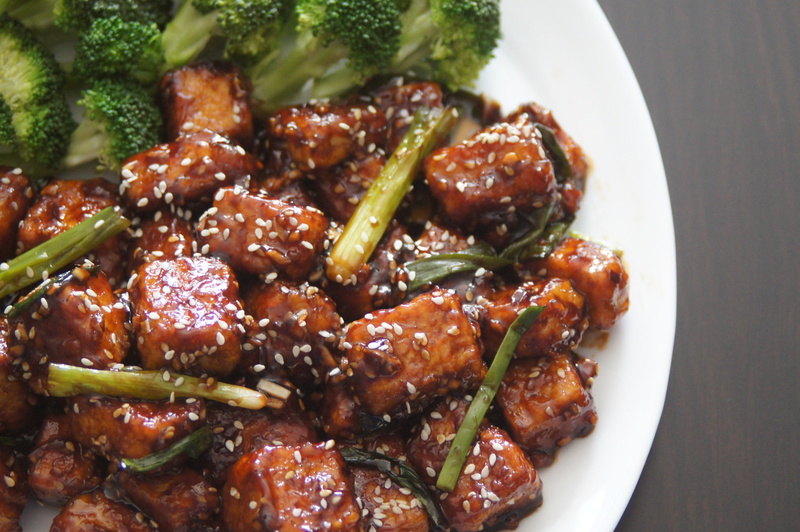 Tofu doesn’t have any flavor on its own but the seasonings and sauce in this dish are amazing! There is so much flavor here that you’ll find yourself saying, “Whoa!” on the first bite. If you’re not a big fan of tofu, but want to try it out, this is a good way to give it a chance. And it’s bite-sized. Perfect for a first date! If serving with rice and broccoli, begin preparing at this time. Otherwise, move onto the next step. Wrap tofu in a clean, absorbent towel and set something heavy on top to wick away moisture, such as a cast iron skillet. Let rest for about 10 minutes. Prep/chop green onions, garlic, and ginger at this time. Set aside. 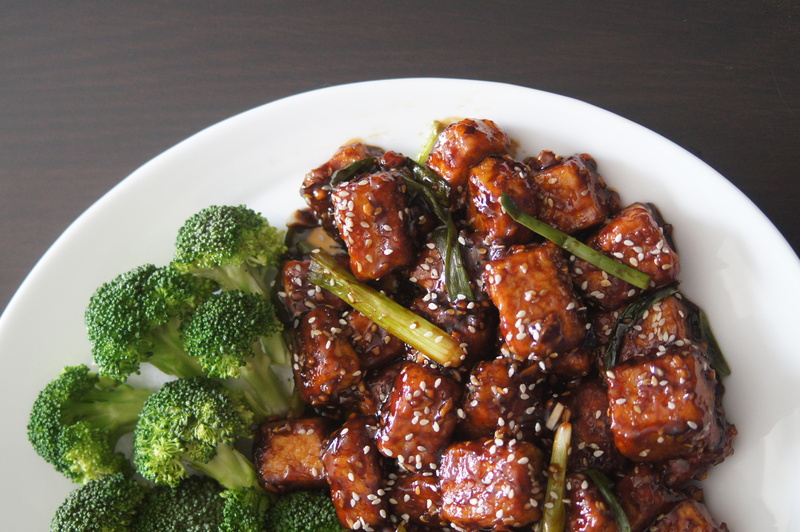 While tofu is pressing, prepare sauce by combining sesame oil, cornstarch, minced garlic, minced ginger, rice vinegar, coconut sugar or maple syrup, tamari or soy sauce, and water in a small mixing bowl and whisk thoroughly to combine. If using coconut sugar, make sure it’s dissolved before proceeding. Taste and adjust seasonings as needed. Heat a large 10” skillet over medium heat. 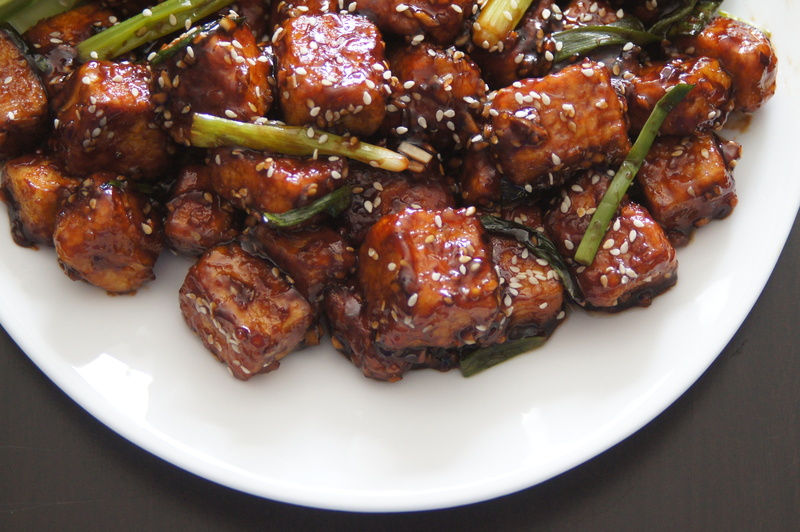 In the meantime, unwrap tofu and cut into even pieces, about 3/4-inch cubes. 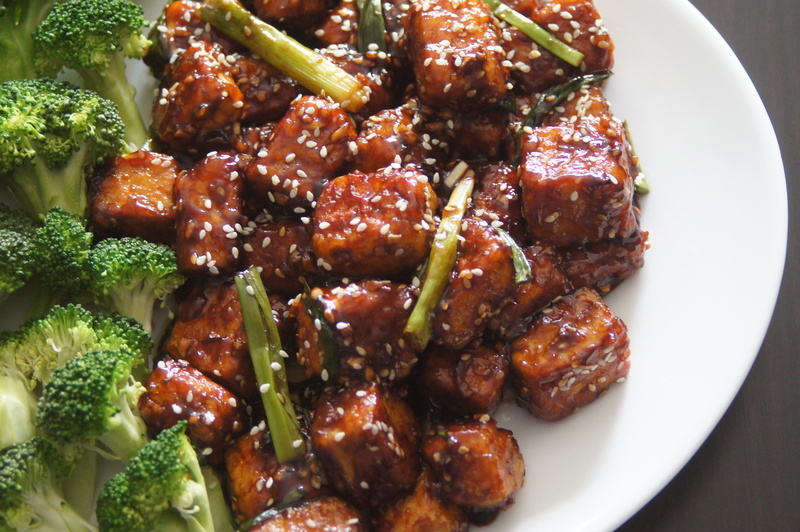 Add tofu to a shallow mixing bowl and top with tamari or soy sauce, chili garlic sauce, sesame oil, and maple syrup. Toss to combine. Let rest 2-3 minutes, stirring occasionally. Use a slotted spoon or fork to transfer tofu to a quart-size or large freezer bag. Add cornstarch 1 Tbsp at a time and toss to coat. Continue adding more cornstarch and tossing until tofu is coated in a gummy, white layer – (I used 4 Tbsp). To the hot skillet, add 2 Tbsp grapeseed oil and let warm for 30 seconds. Then use a slotted spoon or fork to add tofu to the pan (leaving any excess cornstarch behind). Cook on all sides for 1 minute, or until light golden brown. You don’t want it blackened or burned, as you’ll be cooking it again later with the sauce. Aim for a consistent golden brown crust. Remove tofu from pan as it’s finished browning. Set aside. Return skillet to burner and increase heat to medium-high. Add 1 Tbsp sesame oil, chopped green onions, and dried red chilies. Sauté for 1-2 minutes, stirring frequently. Add the sauce and tofu. Cook, stirring frequently, to coat the tofu and vegetables for 1-2 minutes, or until warmed through and the sauce has slightly thickened. Remove pan from heat and add sesame seeds (optional). Toss to coat. Serve with rice and steamed broccoli (optional), or other desired sides. Best when fresh, though leftovers keep for 2-3 days in the refrigerator. Reheat on the stovetop or microwave.